A work force: JobOn's Jody Presti. Jody Presti was walking through the mall near his home in Washington, D.C., in 2010 when he came upon a teenager in the food court with half a dozen job applications spread out in front of him. "I just interviewed at JCPenney," the boy told him. "Now I'm filling out an application for Sbarro." Presti recalls thinking, This is the same thing I did 20 years ago, and nothing has changed. After spending 10 years in the tech world, he was incredulous that simple job applications could not be filled out online. So he began chatting up franchise owners around town. "They all [said] that the application was irrelevant, that they all looked the same," Presti says. "The interview was the only part that mattered." 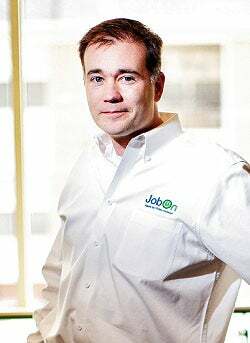 Presti was inspired to create JobOn, an online service that combines the application and interview into one digital package. Instead of job-seekers filling out forms and employers scheduling dozens of interviews, applicants simply comb their hair and answer a few pertinent questions into their webcams before submitting their profiles. Employers can then watch the virtual interviews on their own schedules. While it may not help companies choose a new accountant or CEO, the service--which is free for the first five applicants, or $10 per month for unlimited use--has proved perfect for franchisees who have hourly workers and high turnover. Since launching in September 2011, JobOn has signed on 1,000 companies (about 75 percent of which are franchises), including Subway, Starbucks, Pizza Hut, Jamba Juice and 7-Eleven. We got Presti to tell us how his service helps businesses find good people and mall rats find work. Why do franchisees use this service? The old way has worked for decades. We interviewed a guy with three Quiznos who said, "When I'm down workers, I'm on the line making sandwiches. I didn't spend a quarter million dollars to become a sandwich artist." A lot of people feel that way. It takes valuable time to hire people, and they often end up hiring the wrong people. When we talk to business owners about JobOn, they get it, and they sign up in 15 minutes. The product really resonates with them. Joe Franchisee can log into his JobOn account at 10 p.m., after the store closes for the night, and watch a dozen interviews in four or five minutes, and decide which applicants he wants to move to the next step. He doesn't have to hire someone out of desperation. Why are JobOn interviews so brief? In the beta, we thought employers would want to sit down and conduct a mock interview, like 15 or 20 minutes long. But we found that employers were only going to the third question. They weren't watching more than 90 seconds. We talked to a couple of psychologists, and they told us that people make a decision about folks in the first 10 to 12 seconds. They told us to treat JobOn like a career fair and shorten things up so employers can make a decision in 30 seconds or less. Who is subscribing, franchisees or franchisors? We usually start with a single unit, then multi-unit owners sign on, then franchisors see what we can do, and we have a lot more franchisors coming on now. The franchisors don't want to get involved in the staffing process directly, so they give their franchisees tools and include JobOn as the career management product in their web package. Why is JobOn important now? We started the business knowing that it's socially and economically important to help people find jobs, and to think that the hourly work force is going through the same process they have for 20 years is a really compelling reason for us to do what we do. Getting people jobs is our mission.